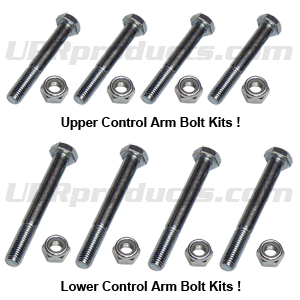 Custom Grade 8 and 10.9 Heavy Duty Bolt kits for all (79-98 Mustangs). We are proud to announce the latest line of Custom Grade 8 and 10.9 nuts and bolts. Replace those Weak Factory Nuts and Bolts and Immediately Double the Strength and safety of your vehicles Upper and Lower Control Arms. Eliminate any chance of Flex or Deflection, that always occurs when you upgrade your upper and lower control arms to better quality bars and bushings no matter what Brand of uppers and lower control arms.